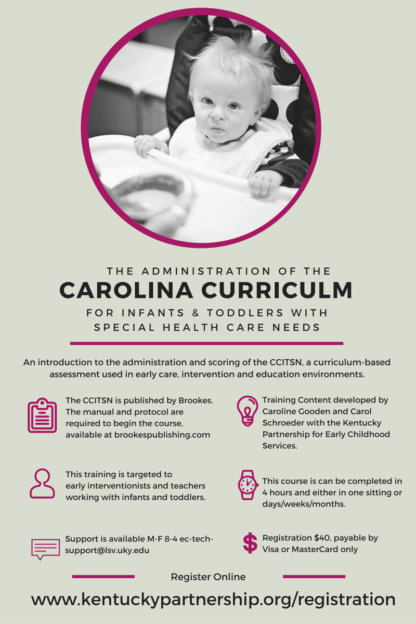 This 4-hour online course introduces providers to the administration and scoring of the CCITSN, a curriculum-based assessment approved for use for KY First Steps providers and published by Brookes Publishing. 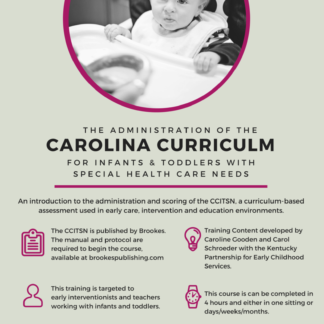 The course will take 4 hours to complete, and provides an overview to the features of the CCITSN. Course materials must be purchased prior to enrollment from Brookes at www.brookespublishing.com. Carol Schroeder holds advanced degrees in Montessori Preschool Education and Early Childhood Special Education.  She directed programs in early intervention and inclusive preschool education and, more recently, directed early childhood projects at the University of Kentucky, Human Development Institute. Teachers and providers working in early care, education and intervention. Collect relevant developmental information about a child to communicate with the family and others on the Individual Family Service Plan (IFSP) team. Use collected information to plan for child progress. Plan periodic assessments and monitor ongoing progress.